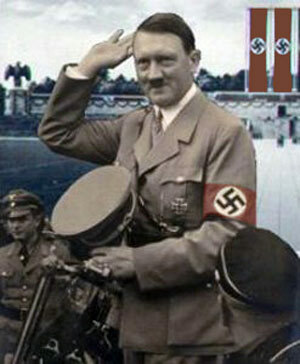 Adolf Hitler was leader of the Nazi Party, Reich Chancellor and guiding spirit of the Third Reich from 1933 to 1945. Hitler was Head of State and Supreme Commander of the Armed Forces. Adolf Hitler was born in Braunau- am Inn, Austria on 20 April 1889. The son of a fifty-two year old Austrian customs official, Alois Schickelgruber Hitler, and his third wife, a young peasant girl, Klara Poelzl, both from the backwoods of lower Austria, the young Hitler was a resentful, discontented child. 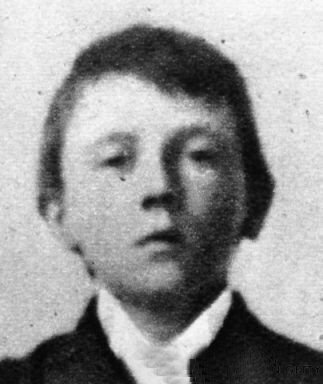 Moody, lazy, of unstable temperament, he was deeply hostile towards his strict authoritarian father and strongly attached to his indulgent hard-working mother, whose death from cancer in December 1908 was a shattering blow to the adolescent Adolf Hitler. After spending four years in the Realschule in Linz, he left school at the age of sixteen with dreams of becoming a painter. In October 1907 the provincial, middle class boy left home for Vienna, where he was to remain until 1913, leading a bohemian vagabond existence. Embittered in his rejection by the Viennese Academy of Fine Arts, he was to spend five years of “misery and woe” in Vienna as he later recalled, adopting a view of life which changed very little in the ensuing years, shaped as it was by a pathological hatred of Jews and Marxists, liberalism and the cosmopolitan Habsburg monarchy. Living from hand to mouth on occasional odd jobs and the hawking of sketches in low taverns, the young Hitler compensated for the frustrations of a lonely bachelor’s life in miserable male hostels by political harangues in cheap cafes to anyone who would listen and indulging in grandiose dreams of a Greater Germany. In Vienna he acquired his first education in politics by studying the demagogic techniques of the popular Christian- social Mayor, Karl Lueger, and picked up the stereotyped, obsessive anti-semitism with its brutal, violent sexual connotations and concern with “purity of the blood” that remained with him to the end of his life. From crackpot racial theorists like the de-frocked monk, Lanz von Liebenfels, and the Austrian Pan-German leader, Georg von Schoenerer, the young Hitler learned to discern in the “Eternal Jew” the symbol and cause of all chaos, corruption, and destruction in culture, politics, and the economy. The press, prostitution and syphilis, capitalism, Marxism, democracy, and pacifism – all were so many means which “the Jew” exploited in his conspiracy to undermine the German nation and the purity of the creative Aryan race. 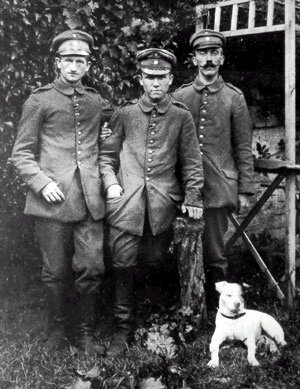 In May 1913 Hitler left Vienna for Munich and, when war broke out in August 1914, he joined the Sixteenth Bavarian Infantry Regiment, serving as a despatch runner. Hitler proved an able, courageous soldier, receiving the Iron Cross -First Class for bravery, but did not rise above the rank of Lance Corporal. He fought on the Western front at Ypres and Fournes, near Lille. Twice wounded, he was badly gassed four weeks before the end of the war and spent three months recuperating in a hospital in Pasewalk. Temporarily blinded and driven to impotent rage by the abortive November 1918 revolution in Germany, as well as the military defeat, Hitler, once restored, was convinced that fate had chosen him to rescue a humiliated nation from the shackles of the Versailles Treaty, from Bolsheviks and Jews. Assigned by the Reichswehr in the summer of 1919 to “educational” duties, which consisted largely of spying on political parties, in the overheated atmosphere of post-revolutionary Munich, Hitler was sent to investigate a small nationalistic group of idealists, the German workers party. On 16 September 1919 he entered the Party – which had approximately 40 members, soon changed its name to the National Socialists German Workers’ Party (NSDAP) and had imposed himself as its Chairman by July 1921. His hoarse grating voice for all the bombastic, humourless, histrionic content of his speeches, dominated audiences, by dint of his tone of impassioned conviction and gift for self dramatisation. 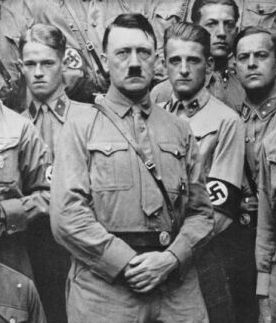 By November 1921 Hitler was recognised as Fuhrer of a movement which had 3,000 members, and boosted his personal power, by organising strong –arm squads to keep order at his meetings and break up those of his opponents. Out of these squads grew the storm troopers (SA) organised by Captain Ernst Röhm and Hitler’s black –shirted personal bodyguard, the SS (Schutzstaffel). Hitler focused his propaganda against the Versailles Treaty, the “November criminals” , the Marxists and the visible, internal enemy Number One, the “Jew” , who was responsible for all Germany’s domestic problems. 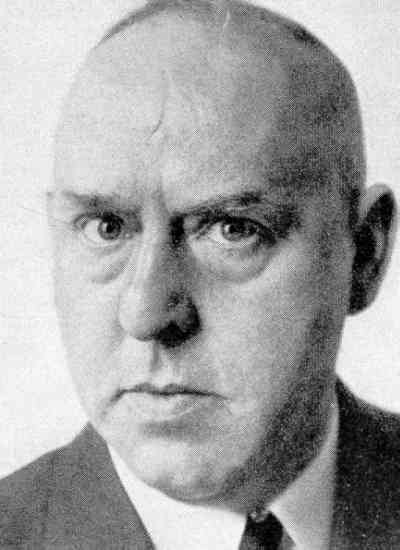 In the twenty-five point programme of the NSDAP announced on 24 February 1920, the exclusion of the Jews from the Volk community, the myth of Aryan race supremacy and extreme nationalism and extreme nationalism were combined with “socialistic” ideas of profit-sharing and nationalisation inspired by ideologues like Gottfried Feder. The earlier days of the "party"
By November 1923 Hitler was convinced that the Weimar Republic was on the verge of collapse and together with General Ludendorff and local nationalistic groups, sought to overthrow the Bavarian Government in Munich. Hitler and Ludendorff then marched through Munich at the head of 3,000 men, only to be met by police fire which left sixteen dead and brought the attempted putsch to an ignominious end. Sentenced to five years imprisonment in Landsberg fortress, Hitler was released after only nine months during, which time he dictated Mein Kampf (My Struggle) to his loyal follower, Rudolf Hess. 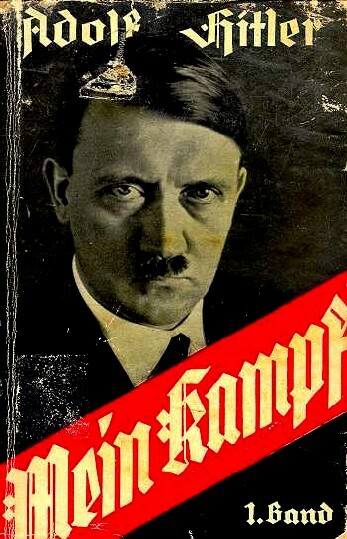 Subsequently the “bible” of the Nazi Party, this crude, half-baked hotchpotch of primitive Social Darwinism , racial myth, anti-semitism and lebensraum fantasy had sold over five million copies by 1939 and been translated into eleven languages. The failure of the Beer-Hall putsch and his period of imprisonment transformed Hitler from an incompetent adventurer into a shrewd political tactician, who henceforth, decided that he would never again confront the gun barrels of army and police until they were under his command. He concluded the road to power lay not through force alone but through legal subversion of the Weimar Constitution, the building of a mass movement and the combination of parliamentary strength with extra-parliamentary street terror and intimidation. Helped by Goering and Goebbels he began to reassemble his followers and rebuild the movement which had disintegrated in his absence. Avoiding rigid, program-matic definitions of National Socialism which would have undermined the charismatic nature of his legitimacy and his claim to absolute leadership, Hitler succeeded in extending his appeal beyond Bavaria and attracting both Right and Left to his movement. Though the Nazi Party won only twelve seats in the 1928 elections, the onset of the Great Depression with its devastating effects on the middle classes helped Hitler to win over all those strata of German society who felt their economic existence was threatened. In addition to peasants, artisans, craftsmen, traders, small businessmen, ex-officers, students and déclassé intellectuals, the Nazis in 1929 began to win over the big industrialists, nationalist conservatives and army circles. With the backing of the press tycoon, Alfred Hugenberg, Hitler received a tremendous nationwide exposure just as the effects of the world economic crisis hit Germany, producing mass unemployment, social dissolution, fear and indignation. With demagogic virtuosity, Hitler played on national resentments, feelings of revolt and the desire for strong leadership using all the most modern techniques of mass persuasion to present himself as Germany’s redeemer and messianic saviour. In the 1930 elections the Nazis vote jumped dramatically from 810,000 to 6,409,000 and they received 107 seats in the Reichstag. Prompted by Hjalmar Schacht and Fritz Thyssen the great industrial magnates began to contribute liberally to the coffers of the NSDAP, reassured by Hitler’s performance before the Industrial Club in Dusseldorf on 27 January 1932 that they had nothing to fear from the radicals in the Party. The following month Hitler officially acquired German citizenship and decided to run for the Presidency, receiving 13,418,011 votes in the run-off elections of 10 April 1931, as against 19,359,650 votes for the victorious von Hindenburg, but four times the vote for the communist candidate, Ernst Thaelmann. In the Reichstag elections of July 1932 the Nazis emerged as the largest political party in Germany, obtaining nearly fourteen million votes and 230 seats. 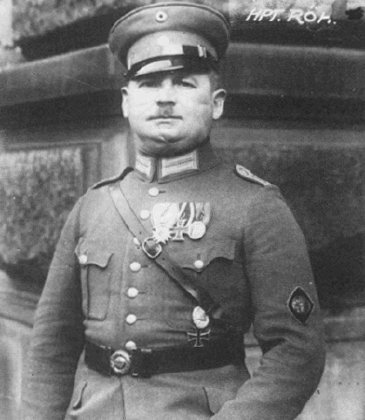 Although the NSDAP fell back in November 1932, to eleven million votes and 196 seats, Hitler was helped to power by a camarilla of conservative politicians led by Franz von Papen who persuaded the reluctant von Hindenburg to nominate the “Bohemian Corporal” as Reich Chancellor on 30 January 1933. Once in the saddle, Hitler moved with great speed to outmanoeuvre his rivals, virtually ousting the conservatives from any real participation in government by July 1933, abolishing the free trade unions, eliminating the communists, Social Democrats and Jews from any role in political life and sweeping opponents into concentration camps. The Reichstag fire of 27 February 1933 had provided him with the perfect pretext to begin consolidating the foundations of a totalitarian one-party State, and special “enabling laws” were driven through the Reichstag to legalise the regime’s intimidatory tactics. 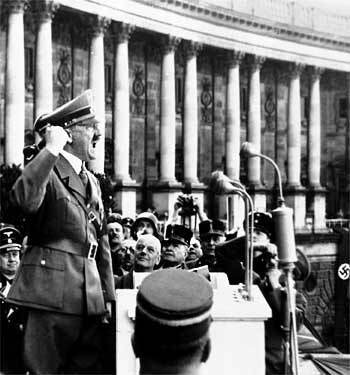 With support from the nationalists, Hitler gained a majority at the last “democratic” elections held in Germany on 5 March 1933 and with cynical skill he used the whole gamut of persuasion, propaganda, terror and intimidation to secure his hold on power. The seductive notions of “National Awakening” and a “Legal Revolution” helped paralyse potential opposition and disguise the reality of autocratic power behind a façade of traditional institutions. The destruction of the radical SA leadership under Ernst Röhm in the Blood Purge of June 1934 confirmed Hitler as undisputed dictator of the Third Reich and by the beginning of August, when he united the positions of Fuhrer and Chancellor on the death of von Hindenburg, he had all the powers of State in his hands. Avoiding any institutionalisation of authority and status, which could challenge his own undisputed position as supreme arbiter, Hitler allowed subordinates like Himmler, Goering and Goebbels to mark out their own domains of arbitrary power while multiplying and duplicating offices to a bewildering degree. rival political leaders abroad, just as he had defeated his opposition in Germany. In 1935 he abandoned the Versailles Treaty and began to build up an army by conscripting five times its permitted number. He persuaded Great Britain to allow an increase in the naval building programme and in March 1936 he occupied the demilitarised Rhineland without meeting opposition. He began building up the Luftwaffe and supplied military aid to forces on the side of General Franco in Spain, which brought about the Spanish fascist victory in 1939. The German rearmament programme led to full employment and an unprecedented expansion of production, which reinforced by his foreign policy successes – the Rome – Berlin pact of 1936, the annexation of Austria and the “liberation” of the Sudeten Germans in 1938 – brought Hitler to the zenith of his popularity. In February 1938 he dismissed sixteen senior Generals and took personal command of the armed forces, thus ensuring that he would be able to implement his aggressive designs. Hitler’s sabre-rattling tactics bludgeoned the British and French into the humiliating Munich agreement of 1938 and the eventual dismantling of the Czechoslovakian State in March 1939. The concentration camps, the Nuremburg racial laws against the Jews, the persecution of the churches and political dissidents were forgotten by many Germans in the euphoria of Hitler’s territorial expansion and bloodless victories. The next designated target for Hitler’s ambitions was Poland(her independence guaranteed by both Britain and France) and to avoid a two front war , the Nazi dictator signed a pact of friendship and non-aggression with Soviet Russia. On 1 September 1939 German armies invaded Poland and henceforth his main energies were devoted to the conduct of a war he had unleashed to dominate Europe and secure Germany’s “living space.” The first phase of the Second World War was dominated by German Blitzkrieg tactics, sudden shock attacks against airfields, communications, military installations, using fast mobile armour and infantry to follow up on the first wave of bomber and fighter aircraft. Poland was overrun in nineteen days - Denmark and Norway in two months - Holland, Belgium, Luxemburg and France in six weeks. After the fall of France in June 1940 only Great Britain stood firm. The Battle of Britain, in which the Royal Air Force prevented the Luftwaffe from securing aerial control over the English Channel, was Hitler’s first setback, causing the planned invasion of the British Isles to be postponed. Hitler turned to the Balkans and North Africa where his Italian allies had suffered defeats, his armies rapidly overrunning Greece, Yugoslavia, the island of Crete, and driving the British from Cyrenaica. The crucial decision of his career, the invasion of Soviet Russia on 22 June 1941, was rationalised by the idea that its destruction would prevent Great Britain from continuing the war with any prospect of success. He was convinced that once he had kicked the door in, as he told Jodl, “the whole rotten edifice of communist rule will come tumbling down,” and the campaign would be over in six weeks. The war against Russia was to be an anti-Bolshevik crusade, a war of annihilation in which the fate of European Jewry would finally be sealed. As the war widened – the United States by the end of 1941 had entered the struggle against the Axis powers. Hitler identified the totality of Germany’s with “international Jewry” who supposedly stood behind the British – American – Soviet alliance. The policy of forced emigration had manifestly failed to remove the Jews from Germany’s expanded lebensraum, increasing their numbers under German rule as the Wehrmacht moved East. The widening of the conflict into a world war by the end of 1941, the refusal of the British to accept Germany’s right to continental European hegemony, which Hitler attributed to “Jewish” influence and to agree to his “peace” terms, the racial- ideological nature of the assault on Soviet Russia, finally drove Hitler to implement the “Final Solution of the Jewish Question, “ which had been under consideration since 1939. The measures already taken in those regions of Poland annexed to the Reich against Jews and Poles indicated the genocidal implications of Nazi-style Germanisation policies. The invasion of Soviet Russia was to set the seal on Hitler’s notion of territorial conquest in the East, which was inextricably linked with annihilating the biological roots of Bolshevism and hence with the liquidation of all Jews under German rule. At first the German armies carried all before them, overrunning vast territories, overwhelming the Red Army, encircling Leningrad and reaching within striking distance of Moscow. Within a few months of the invasion Hitler’s armies had extended the Third Reich from the Atlantic to the Caucasus, from the Baltic to the Black Sea. But the Soviet Union did not collapse as expected and Hitler, instead of concentrating his attack on Moscow, ordered a pincer movement around Kiev, to seize the Ukraine, increasingly procrastinating and changing his mind about objectives. Underestimating the depth of military reserves on which the Russians could call, the calibre of their generals and the resilient fighting spirit of the Russian people, whom he dismissed as inferior peasants. In reality he had overlooked the pitiless Russian winter to which his own troops were now condemned and which forced the Wehrmacht to abandon the highly mobile warfare which had previously brought such spectacular successes. The disaster before Moscow in December 1941 led him to dismiss his Commander –in –Chief von Brauchitsch and many other key commanders who sought permission for tactical withdrawals, including Guderian, Bock, Hoepner, von Runstedt and Leeb found themselves cashiered. Hitler now assumed personal command of all military operations, refusing to listen to advice, disregarding unpalatable facts and rejecting everything that did not fit into his preconceived picture of reality. 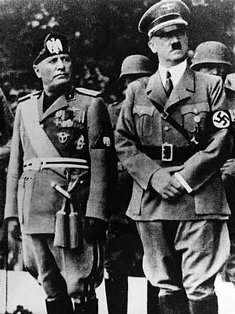 His neglect of the Mediterranean theatre and the Middle East, the failure of the Italians, the entry of the United States into the war, and above all the stubborn determination of the Russians, pushed Hitler onto the defensive. From the winter of 1941 the writing was on the wall but Hitler refused to countenance military defeat, believing that implacable will and the rigid refusal to abandon positions could make up for inferior resources and the lack of a sound overall strategy. Convinced that his own General Staff was weak and indecisive, if not openly treacherous, Hitler became more prone to outbursts of blind, hysterical fury towards his generals, when he did not retreat into bouts of misanthropic brooding. His health too, deteriorated under the impact of the drugs prescribed by his quack physician Dr. Theodor Morell, Hitler’s personal decline symbolised by his increasingly rare public appearances and his self-enforced isolation in the “Wolfs Lair”, his headquarters buried deep in the East Prussian forests, coincided with the visible signs of the coming German defeat which became apparent in late 1942. In July 1943 the Allies captured Sicily and Mussolini’s regime collapsed in Italy, and the German summer offensive was blunted in one of the greatest tank battles of the war at Kursk. In September the Italians signed an armistice and the Allies landed at Salerno, reaching Naples on 1 October and taking Rome on 4 June 1944. The Allied invasion of Normandy followed on the 6 June 1944 and soon a million Allied troops were driving the German armies eastwards, while from the opposite direction the Soviet forces advanced relentlessly on the Reich. The total mobilisation of the German war economy under Albert Speer and the energetic propaganda efforts of Joseph Goebbels to rouse the fighting spirit of the German people were impotent to change the fact that the Third Reich lacked the resources equal to a struggle against the world alliance which Hitler had provoked. Allied bombing began to have a telling effect on German industrial production and to undermine the morale of the population. The generals, frustrated by Hitler’s total refusal to trust them in the field and recognising the inevitability of defeat, planned, together, with the small anti-Nazi resistance inside the Reich, to assassinate the Fuhrer on 20 July 1944, hoping to pave the way for a negotiated peace with the Allies that would save Germany from destruction. 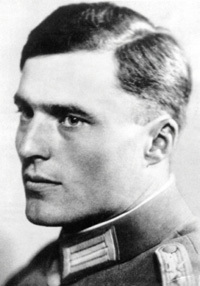 Claus von Stauffenberg Chief of Staff to the Commander of the Reserve Army attended a meeting at Hitler’s headquarters in Rastenburg, East Prussia carrying a bomb in his briefcase. 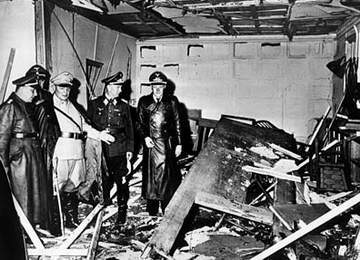 The bomb exploded killing four officers and seven seriously wounded, but Hitler only suffered minor injuries. The plot having failed Hitler took implacable vengeance on the conspirators, watching with satisfaction a film of the grisly executions carried out on his orders. 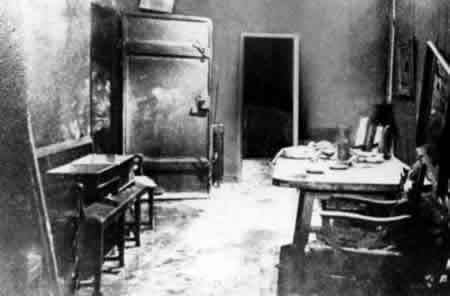 As disaster came closer, Hitler buried himself in the unreal world of the Fuhrerbunker in Berlin, clutching at fantastic hopes that his “secret weapons” - the V-1 and V-2 rockets, would yet turn the tide of war. As the Red Army approached Berlin and the Anglo-Americans reached the Elbe, on 19 March 1945 Hitler ordered the destruction of what remained of German industry, communications, and transport systems. He was resolved that, if he did not survive, Germany too should be destroyed. The same ruthless nihilism and passion for destruction which had led to the extermination of six million Jews in death camps, and mobile execution squads, to the biological “cleansing” of the “sub-human” Slavs and other subject peoples in the New Order, was finally turned on its own people. The following day Hitler committed suicide, shooting himself through the mouth with a pistol. 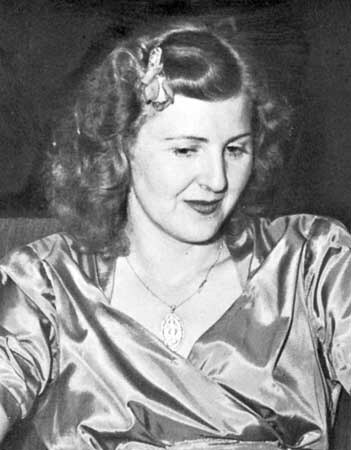 His body was carried into the garden of the Reich Chancellery by aides, covered with petrol and burned along with that of Eva Braun, who also took her own life. This final macabre act of self-destruction appropriately symbolised the career of a political leader whose main legacy to Europe was the ruin of its civilisation and the senseless sacrifice of human life for the sake of power and his own commitment to the bestial nonsense of National Socialist race mythology. With his death nothing was left of the “Greater Germanic Reich” , of the tyrannical power structure and ideological system which had devastated Europe during the twelve years of his totalitarian rule. Who’s Who in Nazi Germany, by Robert S. Wistrich, published by Weidenfeld and Nicolson, London 1995. Hitler Close- Up by Henry Picker and Heinrich Hoffman, published by Macmillan Publishing Co. Inc New York, 1973. The History of the Second World War published by Purnell & Sons Ltd 1966.